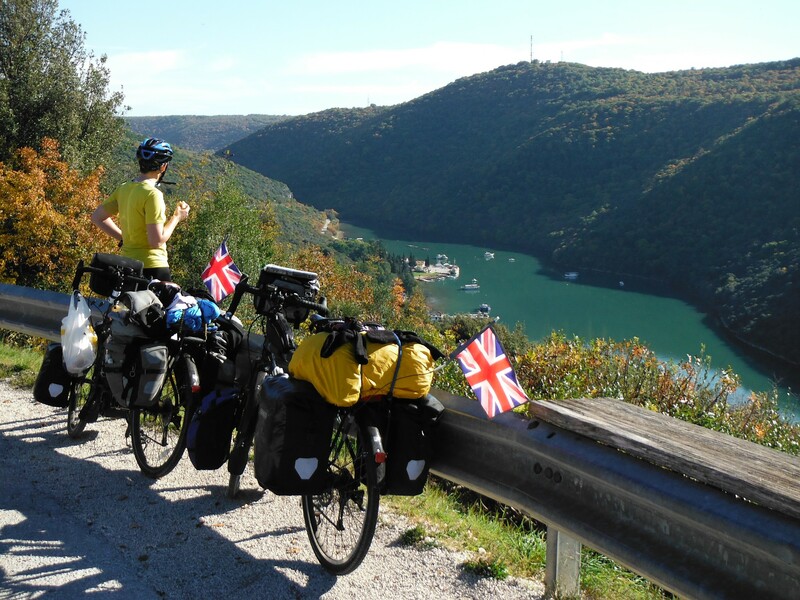 Despite its best attempts to keep diverting us back to the city centre with badly placed bike route signs, eventually we left Trieste, the most un-bike-friendly place of the trip so far and followed signs to Slovenia. The first new country for us, and although we only spent a few hours there, it wins the awards for ‘best short bike route’ and ‘cheapest Lidl lunch’ so far. Both of these are highly coveted awards for us and we do not hand them out lightly. The bike route was a combination of quiet rural lanes and a smooth, flat bike path between the road and the sea. As this mostly followed an old train line, there was even traffic-free tunnels thrown in as a bonus. A point is lost here for the fact that moped riders (helmets optional) can use the bike lane, but outside the towns these were few and far between. All too soon we arrived at the Croatian border, showed our passports for the first time since getting off the boat in the Netherlands (and got a stamp after asking) and immediately hit a steep hill. Welcome to Croatia! 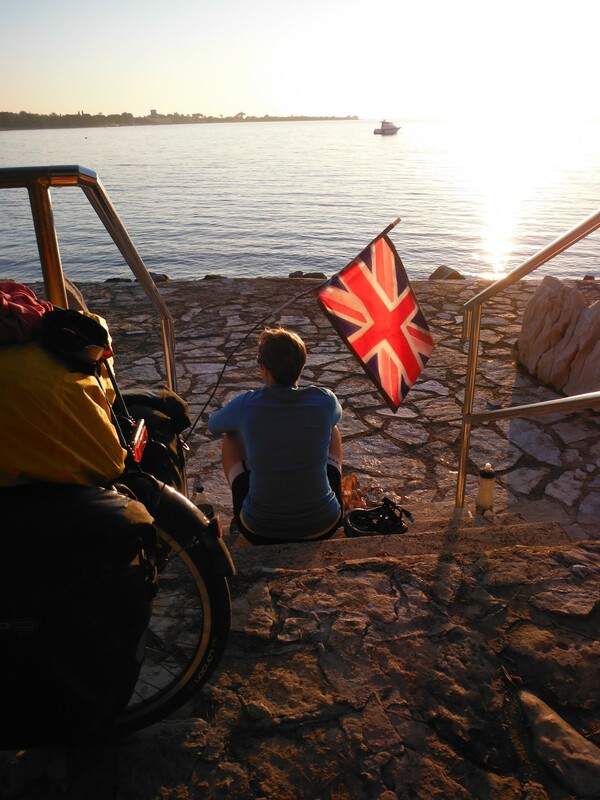 With daylight hours disappearing we came off the wiggly bike route to Porec and took the main coast road instead where the importance of tourism to the area is evident every 50 metres or so. We passed huge adverts for 24 hour casinos, hotels, resorts, spas, campsites (despite these being closed), shopping malls… A combination of our odd meal times and the short days meant that we ate our lunch at a spot where the road met the sea as the sun set and then rode the last hour or so in the dark. To make this already tricky task a bit trickier we reached a point where the road was closed for resurfacing. Not wanting to do a massive detour we asked if we could go through and were waved on. What we hoped was a short stretch turned into 2 miles of rocks to ride/slide/walk through, not the easiest on loaded bikes and it was well and truly dark when we bounced out of the other side. Unbeknown to us we had arrived in Porec the weekend of a car rally, so fell asleep to the sound of engines in the distance. Despite the rally, Porec was eerily quiet. We are long past tourist season, which gives some of the resort towns a ghost-town feel. Bars and restaurants are closed and places are just devoid of people. From Porec we took an inland route in the direction of Dvigrad, an abandoned hill town (abandoned for centuries, not just for the winter, we see semi-abandoned towns all the time). It was so hot we had to seek out shade for stops rather than sun. Every other car that passed us going into Porec was a rally car which was cool until a bit later in the day we heard that familiar sound of the rally engine and realised our planned quiet scenic inland route overlapped with the rally route. Unfortunately as the small road to Dvigrad was being used for the finish it was closed to traffic so we had to abandon that plan and retrace our road back to the coast. 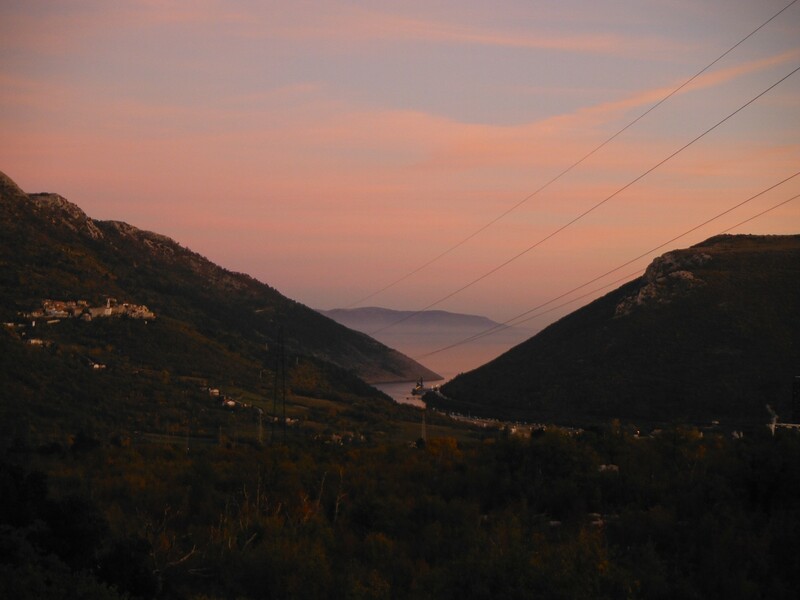 It did mean we passed the Limski canal, a huge steep sided gorge where the sea cuts into the land. Back at the coast we stopped for an ice cream or two (they were small honestly) in Rovinj and decided to call it a day while there was still daylight left to enjoy and sat sunning ourselves for a while, enjoying the sunset from a bench rather than a bike seat for once. This was also our first experience of Croatian Wedding Drivers. It’s easy to lose track of what day it is on this trip, but this phenomenon means that we get at least a weekly reminder. Every Saturday in Croatia we have been passed on the road by processions of cars beeping their horns consistently with their hazard lights on. 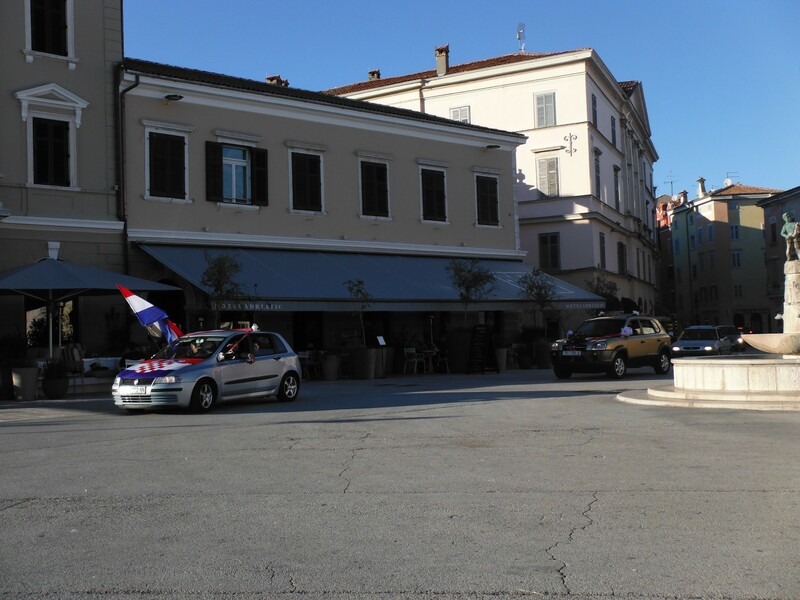 The front car has a huge Croatian flag flying from the passenger window; some cars will have ribbons and other decorations, and all drive in a long procession, zooming past us on the road and slowing down when they reach towns, all blasting their horns. In Rovinj they were skidding around the small roundabout on the waterfront tooting wildly. The combination of rally and wedding drivers on the same day… we were happy to be off the road. 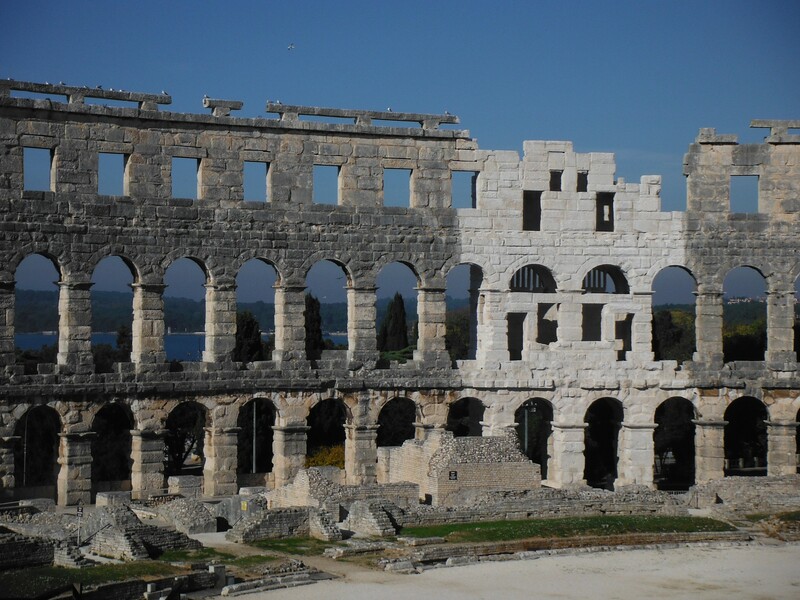 The following day Pula provided an attractive lunch stop, it has a mostly intact Roman amphitheatre overlooking the sea, some other ruins and my favourite tourist attraction, a small scale model of the city complete with fountain to provide realistic sea. Ace. Another race against the daylight, which we again lost, meant that we rode towards Plomin as the sun set. Short autumnal days are annoying in many ways but we have had some spectacular evening skies and with the coastal scenery thrown in as well, we often ride the last hour with massive grins on our faces wondering if life can get any better than this. After a day off drinking Yorkshire tea with milk (a rare treat) with our English warm showers host in Plomin, we made the decision to island hop south from the Istrian peninsula to avoid the coastal road as much as possible. We had read that the road can be busy and narrow, and who doesn’t like going on ferries?